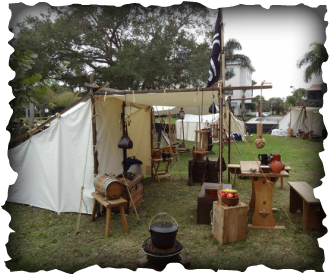 This Living History Pirate Encampment depicts how the crew would live ashore when their ship was in need of repair. Pirates did not have regular access to dry docks as most pirate ships were unlawfully commandeered, so they had to be more creative when it came time to make repairs to their ship’s underside. The pirates would find a hidden cove or a secluded beach and hove the ship over on one side as the tide went out. If the ship received damage such as a cannon shot around the waterline, planks would need to be replaced. This was no easy task since the crew had to locate the right trees to cut their own lumber. Before the ship would be laid over on its side, weapons and other provisions were offloaded to set up camp ashore which included just about anything that could not be tied down. Then an armory would be set up and lookouts posted to keep watch as a ship and her crew would be quite vulnerable in these conditions. After repairs were made the ship would then be up righted with the incoming tide. The ship and crew would then set sail on to pillage and plunder once again. At the Living History Pirate Encampment visitors can see and experience firsthand what a pirate encampment was like, ask questions and learn a bit of pirate history. There is plenty for the little pirates too, interactive games, knot tying lessons, they may even get a quick pirate mustache, an eye patch or a piece of pirate treasure. Those who demonstrate the worthiness to be a pirate may be allowed to sign the ships articles and become an honorary member of the crew.